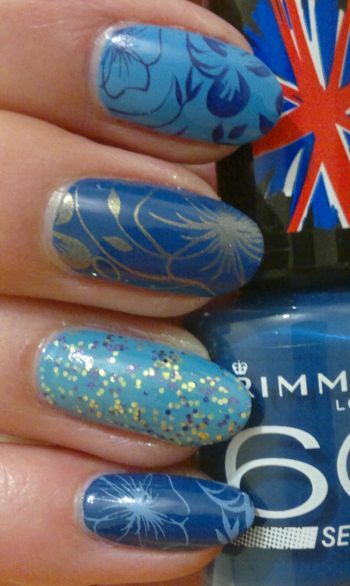 For this mani I painted my nails with Rimmel 60 Seconds 844 Out Of The Blue (2 coats). The colour looks nice, but I really don’t like this polish at all. It stains badly. I should use it as a stamping polish only – this should be OK. 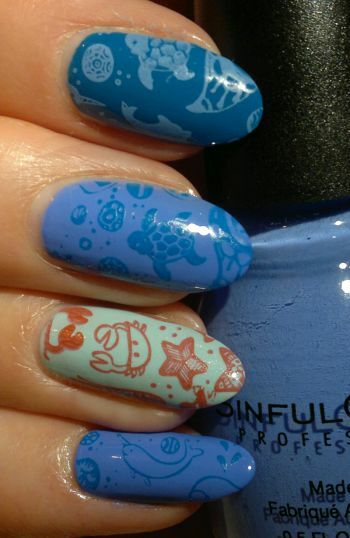 Anyway, since I already had a dark blue base, I decided to do (another) marine-themed mani. 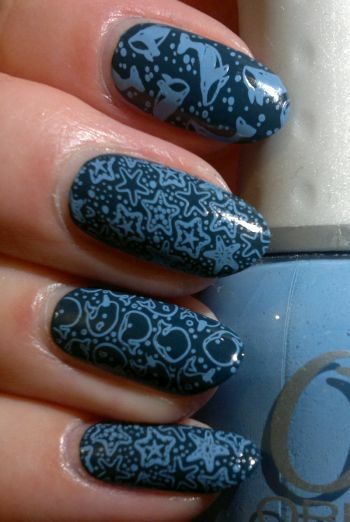 So I used Sugar Bubbles‘ cute SB 031 stamping plate. And I double-stamped with Orly Snow Cone (light blue) and Essence Colour & Go 140 Go Bold (gold). I really like this mani. It’s like… the sea, marine creatures and sunlight. Do you agree? Feel free to comment. And thanks for stopping by! Hi there! Today’s nail of the day post is about a mani I did a little while ago. I didn’t love the mani, so I wasn’t sure whether to do a post or not… well, here we are! For this mani I painted my nails with Essence Colour & Go 171 Galactic Glam (2 coats). I don’t like this polish. 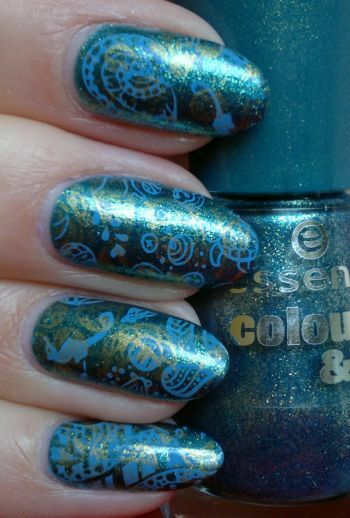 The colour is a mix of blue, green and gold and it has a metallic (almost foil) finish. It’s a mess. Then I thought that double-stamping might save the mani. (It didn’t work!) 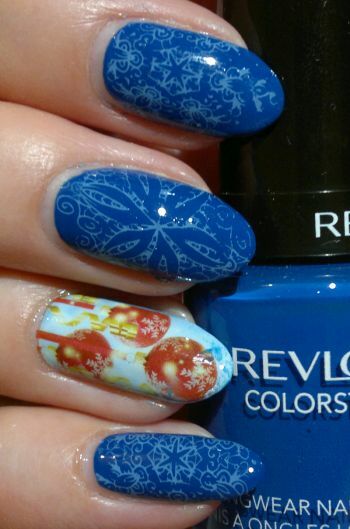 I used Orly Snow Cone (light blue) and Revlon Briliant Strength 110 Hypnotize (gold) to stamp images onto my nails. The stamping plate I used is MoYou‘s super cute Doodles 07 plate. I really didn’t like this mani. Quite a few ladies at work told me how much they loved this particular mani (?). However, it’s definitely one of my least favourite manis of 2017. Hi there! Today’s post is about another Christmas-themed mani I did a couple of days ago. I started by painting my nails with Revlon Colorstay 180 Indigo Night (2 coats). I love this polish. The formula is a dream to work with, and the colour is stunning. 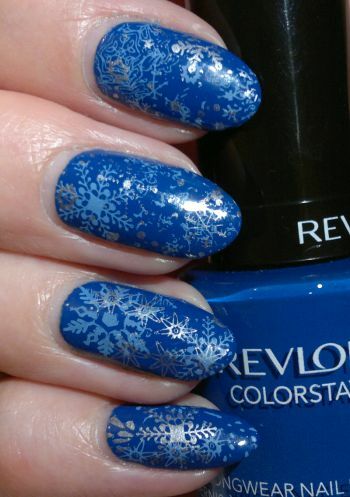 I used my new unbranded Christmas-themed stamping plate and Orly Snow Cone (which is my favourite light blue polish) to stamp images onto my nails. All in all I’m happy with this mani. 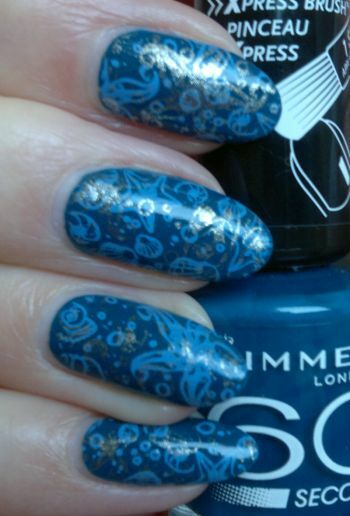 Whilst the stamped images didn’t turn out to be perfect, I still think this mani looks really nice. I also love the blue + light blue + red theme because it’s different from all those standard red/green/gold and blue/silver manis. What do you think? Feel free to comment. And thanks for stopping by! Hi there! Today’s post is another Nail Of The Day post. And this mani is another one that counts towards the 31 Days Nail Art Challenge. I painted my thumb, middle finger and pinky with Rimmel 60 Seconds 231 Blue Eyed Girl (2 coats). And I painted my index and ring fingers with Rimmel Salon Pro 636 Hooray Henry (2 coats). Then I applied one coat of W7 96 Mosaic to my accent nail (ring finger). The images I stamped on are from Pueen’s 72 plate (which is part of Pueen’s Stamping Buffet collection). I think this mani turned out great. I like the colours that I picked, I love the glitter accent, and I think the images are almost perfect. Do you agree? Feel free to tell me what you think. And thanks for stopping by!